Meet Marji. 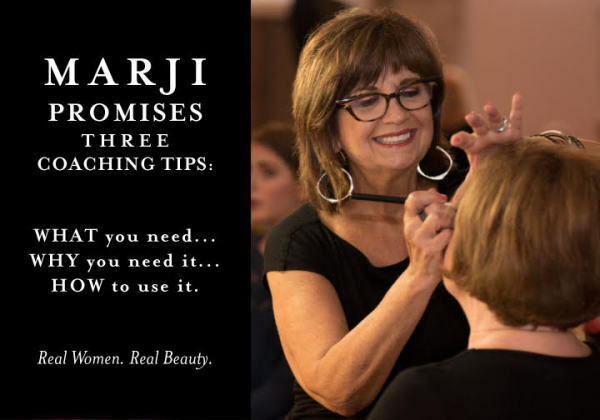 With the eye of an expert in today’s luxury cosmetic lines, Marji helps you develop confidence with What Works for You to create your own signature look and style. She takes the guess work out of a cosmetic world that can sometimes seem overwhelming With a personal passion for helping women, she coaches her clients to become their uniquely Beautiful Best. When Marji discovered her beauty came from within and that the outside reflected how she felt about herself on the inside, she learned how to perfect that reflection. That revelation created a 3 decade career in the beauty industry helping other women learn to discover and reflect their own personal beauty. A Nordstrom icon, Marji is known for creating an individualized look for each of her customers. She provides a personalized experience with each woman in her chair. Her signature looks include: color selections that compliment skin tones, eyes that demand attention and radiant skin. Every client leaves with the knowledge and tools needed to confidently recreate their signature looks. Her signature looks include color selections that compliment skin tones, eyes that demand attention and radiant skin. Her clients trust her for all their skincare and beauty solutions.